March 15, 2012 11:50 am By Lori Post contains sponsored/affiliate links and I get commissions for purchases made from links. As an Amazon Associate I earn from qualifying purchases. A few weeks ago I struck gold at the thrift store. When I saw this cute little solid wood desk for $25, even though it was a little dinged up, I knew it just needed a little spray paint and tlc. The chair was a thrift store find from months ago that we kept in the garage for days we needed extra seating. Cost: $7. The picture frame was found a few days earlier at the same thrift store for a buck. We began by giving everything a light sanding and a good coat of primer. Once dry, we did another light sanding and applied the paint. I used Krylon Black Gloss spray paint. I chose gloss because I wanted the finished product to be easy to wipe clean, and it really isn’t as shiny as you’d think. Looks like new-from-the-showroom furniture. The polycrylic gives it a nice finish. I used a piece of foam board, wrapped it in batting and covered it with fabric to make a bulletin board. Matching ribbon and buttons complete the look. Super easy! I picked up a piece of 14x14x2″ upholstery foam from Hob Lob for $2 and created a matching chair cushion by covering it in the same fabric. The lamp and picture frame are from Hobby Lobby too. All told we spent under $75 for this desk, chair and bulletin board fix-up. Not too shabby! The good thing about thrift store redos like this one is that they really don’t require any special skill. Just a little patience and effort. And if/when I mess up, I can just break out the sandpaper and start all over again! Like this post? Be sure to subscribe for free daily email alerts and you’ll be entered for a chance to win an iPad 2! Linking up to Thrifty Decor Chick Spray Paint Party! January 20, 2012 11:00 am By Lori Post contains sponsored/affiliate links and I get commissions for purchases made from links. As an Amazon Associate I earn from qualifying purchases. I came across this eyesore mail holder at one of my weekly thrift store adventures. I’ve been wanting to organize my desk, but there really isn’t anything in the budget for cute chotchkies and containers. So I realized if I was gonna do this I would have to do it using thrift store rescues. I’ve never gone thrifting for the purpose of finding containers so I wasn’t sure what kind of luck I would have. Turns out, I just wasn’t looking hard enough. 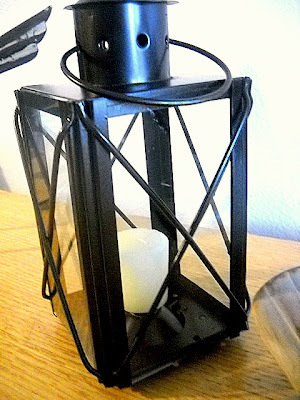 I managed to find several items that make for great office organization aids once given a makeover. For this project, I used scrapbook paper and mod podge. Super easy, and it took me all of 20 minutes to complete. Oh, and my total cost? Around $0.75. Do you have any trash to treasure thrift store finds? Share them in the comments, or leave a pic on the MBH facebook page! July 22, 2011 11:00 am By Lori Post contains sponsored/affiliate links and I get commissions for purchases made from links. As an Amazon Associate I earn from qualifying purchases. Vintage Songbird repurposed an old nightstand, turning it into a play sink! July 11, 2011 8:12 am By Lori Post contains sponsored/affiliate links and I get commissions for purchases made from links. As an Amazon Associate I earn from qualifying purchases. Poetic Home found an interesting use for a thrift store chair…it’s a swing! Sabby in Suburbia turned a coffee table into a bench. A new spin on a chore chart, courtesy of Today’s Fabulous Finds. Or how about this idea by A Thousand Words? She turns chores into a game! May 31, 2011 8:00 am By Lori Post contains sponsored/affiliate links and I get commissions for purchases made from links. As an Amazon Associate I earn from qualifying purchases. Up until recently, I have been a thrift store snob. I would stop in from time to time to look at the furniture, picture frames or other household items. But never for clothes. And then I discovered this tiny little thrift store just off the road where I drop my kids to school and decided to drop in one day. 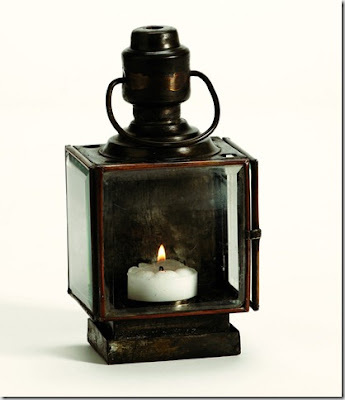 Not only have I been able to find cool roadside rescue projects like this Pottery Barn Knock Off Lantern, but I have had great success finding good quality brand name clothing for my kids. See that photo at the top of the page? That’s a $2 Abercrombie tee and a $2 American Eagle Vintage polo. Cha. Ching. A few of you might be wondering why I’m so excited about the ratty looking shirt that says Fitch. Well, in case you didn’t know it’s suppose to look like that. In fact, the first schmuck who bought this shirt paid alotta money for that look. Same goes for the distressed looking polo. Trust me, this is a serious score. May 24, 2011 8:00 am By Lori Post contains sponsored/affiliate links and I get commissions for purchases made from links. As an Amazon Associate I earn from qualifying purchases. Can you believe this was once a tired old entertainment center? Visit Fresh Cut Flowers for the details! April 4, 2011 8:44 am By Lori Post contains sponsored/affiliate links and I get commissions for purchases made from links. As an Amazon Associate I earn from qualifying purchases. 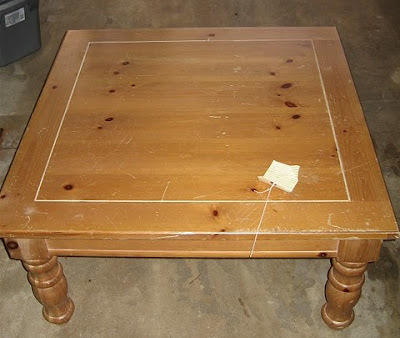 Today is all about turning thrift store furniture into beautiful rustic pieces. If you’ve always wondered how to paint furniture, you’ll find lots of details and tutorials within these links! This old hopeless looking thing. Wow! I have to admit, I likely would have walked right past this in the thrift store…I just don’t think I would have recognized the potential! Visit A Brush of Whimsy for the story on how she turned a Craigslist find into this sweet shabby vanity for her daughter. A Goodwill find turns Pottery Barn knock-off with the help of a little paint and elbow grease from Living in the Woods. Red Hen Home used her free sample of Valspar paint to turn an old beat up dresser into this lovely. Fabulously Flawed scored a sweet $10 find on Craigslist and turned it into this masterpiece. I have a sofa table I am in the process of painting that would match this perfectly. I hope mine turns out as nice as this one did! Just goes to show that we can have a nicely furnished home on a super tight budget with a little courage, a little paint and the right find! March 23, 2011 10:07 am By Lori Post contains sponsored/affiliate links and I get commissions for purchases made from links. As an Amazon Associate I earn from qualifying purchases. 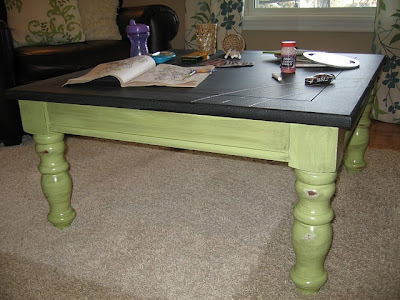 Into this cool chalkboard-top table! What a great idea! 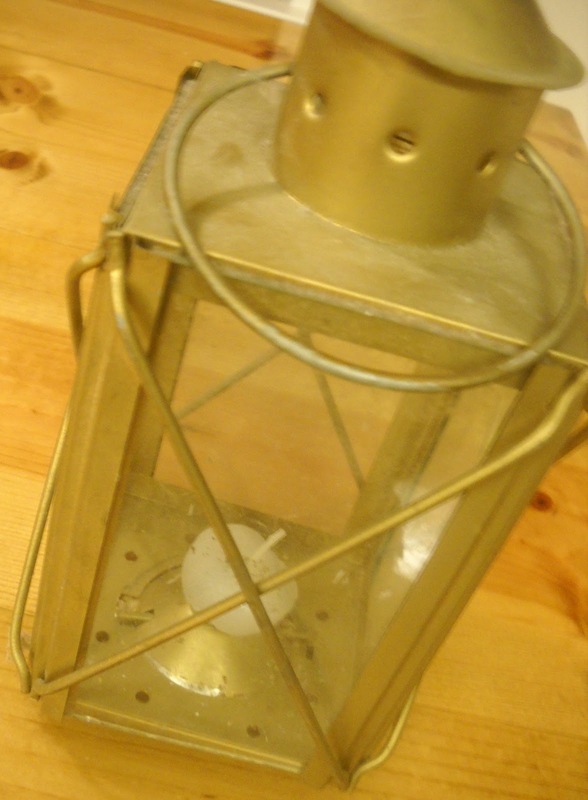 My Thrift Store Lantern Revamp! March 22, 2011 8:00 am By Lori Post contains sponsored/affiliate links and I get commissions for purchases made from links. As an Amazon Associate I earn from qualifying purchases. 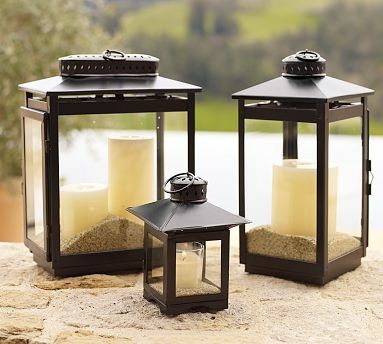 I love Pottery Barn lanterns. Which is why I was so geeked to find this little number at my local thrift store. Love the cobwebs. Very rustic. After seeing Pretty Handy Girl redo a similar lantern I was inspired to give this a try myself! …then ran over to Walmart and bought a can of Krylon Oil Rubbed Bronze spray paint. After a thorough cleaning, I gave it a couple of good coats. I’m pretty happy with the result. My total cost including spray paint was less than $5! Compare with $40-$50 for the Pottery Barn or Ballard versions, we’re talking 90% savings. My kind of deal! It’s been awhile since I’ve been motivated to do some serious thrifting. But after finding this treasure, I think they’ll be seeing a lot of me! February 15, 2011 2:17 pm By Lori Post contains sponsored/affiliate links and I get commissions for purchases made from links. As an Amazon Associate I earn from qualifying purchases. Visit Show Tell Share to see how she upcycled her old tees using a bleach pen!